Spanish Health Ministry has just published the preliminary draft law for TPD transposition in Spain. As all vaping advocates knew, this bill would be bad for vaping, vapers and traders in the country but, this time, the maneuver orchestrated by the health ministry bureaucrats and counselors, many of them with senior positions in medical associations, previously architects of disinformation that ended with the sector in Spain, has been proper to the very same Machiavelli. 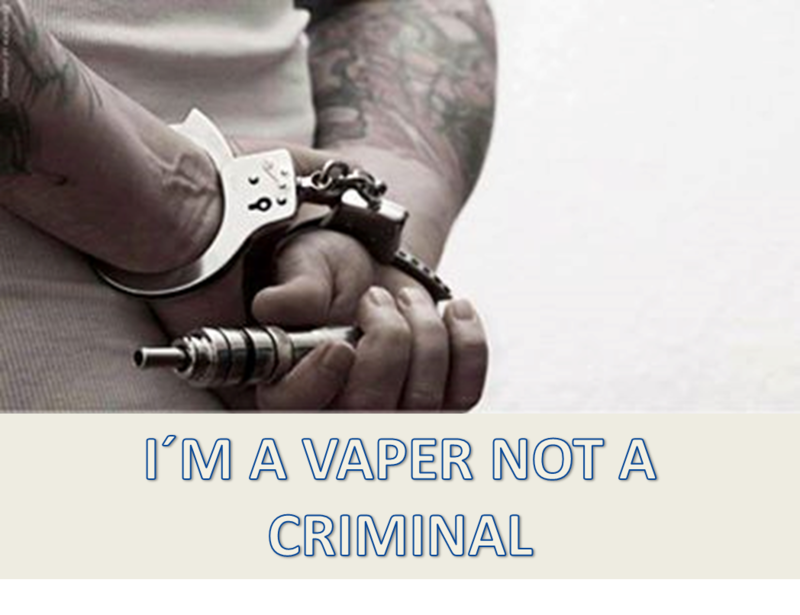 The bill, not only does not conform to the TPD text but amplifies restrictions absolutely unsolvable for the survival of electronic cigarette market in the country. If this bill becomes real, Spanish legislation about electronic cigarettes will be the more restrictive in the world, even higher than those stablished for the tobacco. This is the final stab. Here you have the abomination that will end with the remedy to smoking in Spain, and will be responsible of, at least, thousands of deaths… unless we prevent it. SALES ALLOWED ONLY IN ESTANCOS (Official Tobacco Stores), PHARMACIES AND SPECIALIZED PHYSICAL STORES with previous payment of the corresponding rates of license and registration fees. 500 Euros per product (including every nicotine strength or part of a dispositive) placed on the market it´s only one of the taxes. This taxes do not affect to estancos and pharmacies. FORBIDDEN ANY FREE SAMPLES, OFFERS AND DISCOUNTS ON ALL DEVICES SUSCEPTIBLE TO RELEASE NICOTINE, AS WELL AS IN ANY ACCESSORIES, INCLUDING LIQUID RECHARGING. Added to those already stablished by the TPD, the new text introduces a huge unfairness in front of Big Tobacco and Big Pharmaceutical industries, which could easily accomplish with these assumptions without problems but, as we know, not maintaining the diversity of devices and e-liquids, which are precisely the key element to quit smoking. Moreover, the incorporation of pharmacies as e-cigs selling point is a clear contradiction to the stance that the Ministry of Health itself has been advocating to date. Inasmuch as the product CAN NOT BE OFFERED AS A METHOD AGAINST TOBACCO, BY ITS OWN ARGUMENTS. So What kind of macabre and cynical joke is this? Despite the fact that the TPD is an obsolete and absolutely mistaken rule before it’s unavoidable birth, the European Directive clearly identifies the electronic cigarette as a different category from the conventional tobacco product and, therefore, should be transposed literally preventing differences among the EU countries, because homogeneity is what member states should seek in a communitarian rule. The draft bill of the Spanish Ministry of Health introduces new onerous economic and administrative requirements which could not be complied for small and medium traders that are now operating in the market, in a more than a precarious situation. Large number of traders had managed to survive by relying on a professional service and assuming the transition from physical to electronic commerce stores. Now online stores are forbidden so, What can we make? In addition, the geographical distribution of existing physical stores that have survived to the disinformation campaign, make impossible the acquisition of products by users. So consumers will not have physical access to specialized vapeshops; only be able to buy in estancos and pharmacies. IT´S ABSOLUTELY PERFECT, ISN´T IT? These requirements are quite overextended and none of the Spanish vaping associations understand their motivation, falling in the most stringent and restrictive legislation in the world, with absolutely no scientific argument that endorses it, and going even further to those required to traditional tobacco. Despite the fact that the legal document says that all involved groups have been consulted, that´s ABSOLUTELY FALSE. Neither UPEV (trade association) nor ANESVAP (user association) or MOVE Spain (Medical Organization) have been consulted. The new restrictions will cause an insurmountable inequality, both in relation to other countries as well as among those involved in the industry itself, leaving completely the vaping niche at the mercy of powerful new actors; tobacco and, interestingly, now the pharma too. The adoption of this draft will mean the total annihilation in our country of the greatest remedy against smoking that has ever existed. Since the effectiveness of these devices to quit is directly related with the easy access from the user to a wide variety of products and systems that fits its level and type of addiction, and taking into consideration that something like that, can only be achieved in a healthy market, with quality, dynamic and wide open to development and innovation, the application of this draft will bring the loss of thousands of lives by forcing thousands of vapers to back to the lethal smoking. He hecho un resumen del proyecto de ley copiando sólo lo que afecta a los cigarrillos electróinicos o como los llaman ellos “dispositivos susceptibles de liberrar nicotina”. Vergonzoso si consiguen tirarlo para adelante. El resumen, aunque es interesante para todo vapeador, es especialmente interesante pa los que como yo, importamos, vendemos o distribuimos estos productos. Llevo muchos años en el sector, fuimos de los primeros, antes de que llegaran las franquicias Italianas, tengo una empresa con 6 empleados que tendré que echar a la puta calle si nos joden el negocio en beneficio de las grandes corporaciones. Por no hablar, que yo , personalmente, siento que estoy ayudando a mucha gente a dejar de fumar y por tanto a una muerte casi segura por tabaquismo. Me gustaría hablar directamente con ustedes, tenemos que hacer fuerza todos juntos. Por ejemplo, para el tema de tasas, podriamos montar una coperativa o algun tipo de sociedad de bienes (hablo sin saber del tema) que nos permita hacerlas frente para poder seguir vendiendo. Como estas seguro que encontramos más soluciones.